Connect Four is a vertical game that consists of checker-like pieces that you must strategize to group in a row of four. It’s simple in concept, but can be challenging in play. The game contains only two brief pages of instructions, proving how uncomplicated it is. Just assemble the standing game grid and separate the checkers by color and you’re ready to play. While in horizontal Checkers black goes first, in Connect 4 it doesn’t matter (just take turns having the lead round by round). On your turn, drop whatever color checker you are down one of the seven descending slots. Think carefully before you move, because you’re not allowed to get a checker back after you’ve said sayonara to it.Players alternate depositing their individual checkers, building off of the ones below and aiming to form lines of four of their same color (I think four’s the magic number because three is too easy and five takes too long). Connections can be up, down, or diagonally only (no crazy Bingo formations like four square here). Occasionally you’ll get a cat’s game where nobody made a row of four, showing that you’ve met your match in players competition-wise. It’s best to attempt to set up your checkers so that with one line you can win two ways, as your opponent can only block you one spot at a time. When a player has dropped their winning shot, he says “Connect Four!” and the play is over. Avalanche all of the trapped circles by sliding the release bar at the bottom of the game. Remember to reset it if you plan to play again, otherwise all of your moves will go right on the table! Connect Four is a good strategy/thinking game that can be played in tournaments. If the toyish plastic is overlooked, it can be appreciated by adults as well. While Connect 4 is well-known and regarded as a classic, I find it rather dull. It’s too simple of a concept to pay for when you can just play Tic-Tac-Toe for free. A person won’t be missing anything if they don’t ever play it in their life. 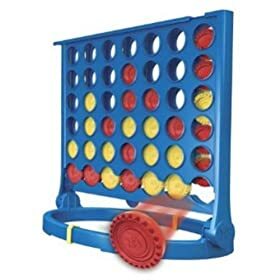 Connect Four is better suited to play electronically when you’re on the go and against a hard computer if you want it to actually be fun. Connect Four is a good choice for the classroom. It won’t impress individuals used to more innovative and flashy games.